Surveying is probably more complicated than most people want to understand, but if you own land or are thinking of buying land, an understanding of what information is conveyed on a Plat of Survey can be invaluable in making good decisions. This series is an effort to take some of the mystery out of reading a plat of survey. Before going further, a couple of definitions are in order. A survey is the actual process of going to the property and physically finding the boundaries and measuring the directions and distances between boundaries. A plat of survey refers to the piece of paper on which the surveyor has rendered a representation of what the surveyor found on the ground. More often than not, a plat of survey is just referred to as a plat. A surveyor is a person licensed to create plats of survey. In Georgia this may be a Registered Land Surveyor, or a County Surveyor. A County Surveyor is allowed to perform surveys in their county only unless they also are Registered Land Surveyors. An associated name – This can be the name of a subdivision, who the property was surveyed for, or a general name that helps identify the property. Property location: In Georgia you will usually find the State, the county, the Georgia Militia District or the township, section, and range. It may or may not contain further information such as street address, Lot and Block information, or other identifying words. Location information is essential in that legal descriptions require recitation of State, and county. Size or Acreage: A plat will normally contain a line of information that describes the size of the property as determined by the survey. It is normally expressed as acres, but may be expressed as square feet (43,560 square feet per acre.) This information may be found in the information block or in the middle of the drawing. Scale information: Usually you will find a written scale that the plat was originally drawn with, i. e. 1″ = 200′. 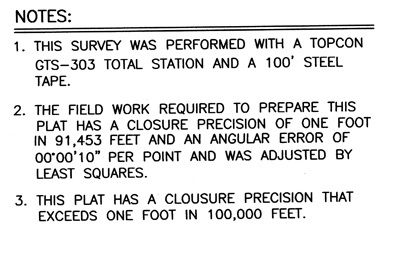 This would mean that a line drawn that is one inch in length on the paper would be equivalent to 200′ on the ground of the property being surveyed. Date of Survey: The date which a property was surveyed is important for many reasons. The date indicates things that the surveyor found at a particular date and these may readily have vanished at a later date. For instance when a corner is marked as the base of a pine tree, that tree may have been removed at a later date. Magnetic declination also varies according to the date. Trying to use badly outdated plats for magnetic reference can induce serious error. Scale Bar: A scale bar is a bar showing the length of certain lines relative to the drawing. This is important since many plats are photocopied and in the process many change the scale on the paper. By measuring the actual scale bar, a user can determine if the actual scale has been modified and if it has, how it can be corrected. 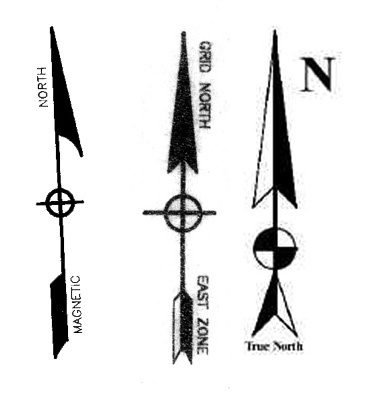 North Arrow: North Arrows can reflect either Grid North, True North, or Magnetic North. Usually most plats in Georgia reflect Magnetic North, but not always. A Magnetic North arrow is indicated with a symbol with a half barbed arrow. This is the direction that a compass needle will settle on barring any outside influences. The advantage of this system is that it is easy to implement even with older instruments. The disadvantage is that magnetic north changes with time, and a later surveyor must either adjust for magnetic shift or take new bearings. Simplicity makes this the most common bearing system of plats. All directions on the plat will be stated relative to the North indicated on the plat. Grid North is becoming more common. Grid north is determined by choosing a system that is rectangular and parrallel to the prime meridian. This makes representation on a plat easier and allows the surveyor to assume a flat surface instead of dealing with the curvature of the earth. New computerized surveying equipment makes this a more popular choice now than it was before. True North is the direction to the North Pole, that is the point at the axis about which the earth rotates. This point is readily determined by observations of the North Star which is within one degree of true north. It may also be determined with solar observations and accurate time along with charts. True North is the least used. Fortunately, in our area both Grid North and Magnetic North tend to be within 2 degrees of True North. Surveyor’s Information: This usually includes the name of the surveyor, license number, type of licensure, a company name, and quite often contact information. 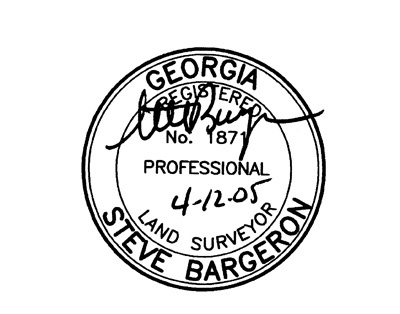 Surveyor’s Seal: In Georgia, a plat of survey is only recordable if it has the Seal of the Surveyor on the plat. This will indicate his licensure with the state, his license number and either an imprintable seal or his signature on a stamped seal. A plat legend: Surveyors use a lot of short hand in drafting plats to save space on the drawing surface. The legend helps you understand symbols and abbreviations used by the draftsman. 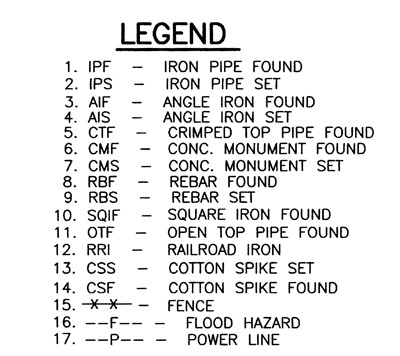 The symbols and abbreviations tell the reader what the surveyor found on the ground and what the abbreviations on the plat mean. Surveyor Notes: Surveyors often put notes on the plat to further explain conditions found on the ground as well as equipment used to create the survey. Location Sketch: Quite often surveyors place a location sketch on the plat to assisst the reader in determining the relative location of the property within the county. Easements and Restrictions: Sometimes, particularly in developments, surveyors show easements for drainage, easements for utilities, rights of ingress and egress, right of ways, setbacks, and other restrictions that may limit what rights are conveyed to the property if the plat is used as a reference. This is very important to a purchaser since the property rights he receives may be subject to those restrictions even if they otherwise not stated in the deed. In part II we will discuss those items on a plat of survey that show the actual delineation of the property including boundaries, natural boundaries, monuments, roadways, as well as metes and courses. This entry was posted in Augusta GA, Georgia land for sale, Law and Regulations, Real Estate Market. Bookmark the permalink. this website carries amazing and truly excellent stuff in support of visitors.